Solstice is here, the annual Alumni meet here on the ISB campus. And today was yet another amazing evening. In fact we were looking forward to tonight, since we were supposed to experience a true musical extravaganza. And none of us left disappointed! We began with the '09 band singing their trademark songs, followed by our very own Conjoint dishing out GNR, MJ and Metallica numbers. Some songs are absolute bea uties, timeless wonders indeed - Beat it, Eye of the tiger, Sweet child 'o mine for instance. And then just as we began to think that the evening couldn't possibly get any better, well, it got better than the best! 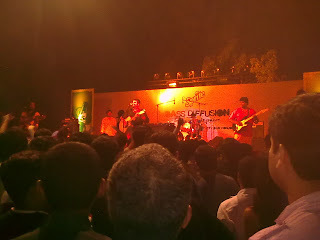 Raghu Dixit was in the house!! And mannnnnn Indian non-film music can be gooddddddd... They started off with Hey Bhagwaan and moved on to Mysore se aayi and a couple of Kannada folk songs. And then when they went on to 'I am in Mumbai, waiting for a miracle', almost all of us Bambaiyyas in the crowd went along holler lane! Vivid images of Maximum city played out in front of our eyes as we heard that song. And then we had the best song of the evening in 'Har saans mein, har dhadkan mein ho tum'. The crowds went completely ballistic. When the band announced the last song, the crowds yelled for more. The atmosphere was electric. There were lazer beams flashing around, true rock show style, but the psychedelic colors paled in front of the enthusiasm of the crowds. Chants of 'once more once more' went up, louder than ever. And the band complied. Not once, but time and time again. The crowds sang along, screamed along, danced, jumped, and completely LIVED IT UP! A show that was to go on from 9.30 to 12.30 went on all the way till 2 am! And the crowds never tired. The youthfulness was palpable, and almost everyone had shed off all veneers of maturity and gentility, almost going back to the carefree days of undergrad and school! You're worth it and you don't know it! 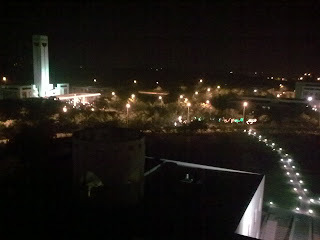 Bliss supreme - the evening after exams! !